Happy Thanksgiving to everyone here in the USA. May wonderful things come your way. I have many things to be thankful for. P.S. 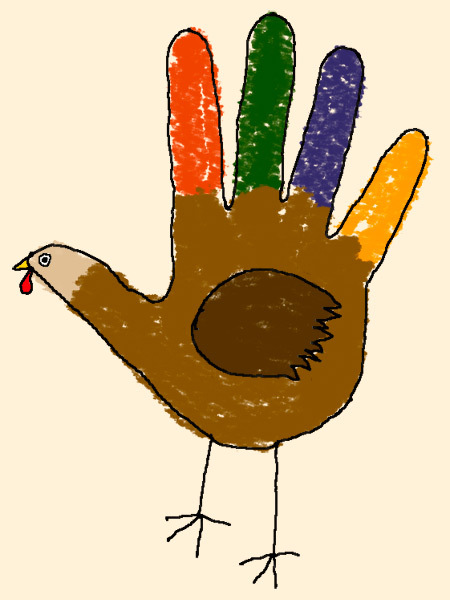 To gentle readers from outside the US… That’s called a “hand turkey.” It’s a traditional Thanksgiving craft that harried moms use to keep their kids out from underfoot and away from the food until it’s ready. Looky, looky what I have! Don’t you just love these colors? If you are reading this on the blog vs. on a feed reader, do the colors look… familiar? Yeah. That’s right. 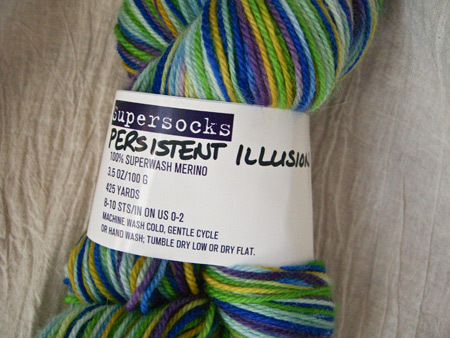 It’s named Persistent Illusion. I’ve never had my very own colorway before, and I’m totally stoked. I’m not sure yet exactly what I’m going to do with it. It most likely will be socks – but they will have to be very cool socks. Since there are already two pairs of socks on my needles this does, don’t you agree Gentle Reader, warrant careful consideration. I will keep you informed of what I come up with. Right now, all I can say is ooooo… pretty… ! I think this is going to be a regular colorway. But, if you like it, it never hurts to let Stitchjones know. And while you’re at it, click on the “shop online” button and check out the Glam Socks. OMG! Yes, there may be some of this in my stash, too. Just saying. I knit fairly obsessively all weekend and finished the double-knit Moebius. Or Klein bottle. Or whatever it is. I am pleased – both to be finished and with how it turned out. It came out just the right size — just long enough to wrap snugly around my neck and tuck into my coat, but not so long that it will be overly bulky. The silk in the yarn gives a nice drape, and the Merino makes it soft and cuddly. I didn’t block it, per se, but I did think it would benefit from a bit of steam. So I steamed it for just a bit with steam from my iron (iron not applied – only steam) and then hung it up to dry thoroughly. confidential to Cat — Yes, I swatched. Gauge matters. I can be taught. You should be proud of me because someone asked how many stitches I cast on and I remembered the look you gave me when I asked how many would be a goodly number and I refused to tell them. I said they should swatch. 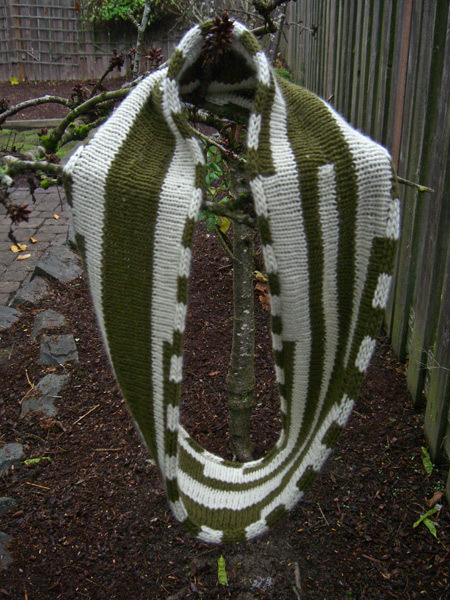 I changed colors rather randomly, but once I’d changed, that sequence was knit for 5 rounds before I changed again. So sometimes I got rather wide blocks of color, as you see on the left, and sometimes I got a more stripey look, as you see on the right. In real life it almost looks like someone started to draw a petroglyph but wasn’t sure what it was supposed to be and just sort of doodled around – for practice maybe. I was hoping for better light to shoot pics. But this is Oregon and it’s winter and that’s just not going to happen. But it doesn’t look entirely out of place cozying up to my mossy cherry tree. The colors are pretty true. ed. 11/20/08 7:47 am — When writing this post, I didn’t have the ball bands with me, so I tried to figure out the colors by looking online. There were two greens that are very similar, and I picked the wrong one. I have now changed the info below to the correct color: 123 (Dark Bronze). No, I don’t know why it’s called that. It’s really green. Cascade Venezia – 70% Merino, 30% silk; 100gr (102 yds) per ball; 1 ball each of 101 (White Heaven) and 123 (Dark Bronze). There was a goodly bit left over – enough for a hat, maybe. Lest you think that I did nothing up north but eat and pet alpacas and eat and buy a little yarn and eat and twist my mind around multi-dimensional knitting projects and eat… I also knit socks. How surprising, eh!? Cat Bordhi presented her new sockitecture – The Houdini Sock. Please hie thee over to the fall 2008 edition of Twist Collective, where you will find the basic pattern. Cat once again proves her knack for thinking way outside the knitting box and coming up with unusual and inventive ways of approaching something that most of us thought had been all thought out hundreds of years ago. The basic idea behind the Houdini Sock is that you start at the toe, knit a foot, knit a heel and bind off. You then have what Cat calls a footprint – a vaguely foot-shaped, flat tube, closed on both ends. There’s no place to get your foot into it. But it looks cool and you can knit a few or a dozen and pile them in a basket or some such (if you don’t have a fiber-eating feline sharing your living quarters). Then, when you want a sock, you decide which side is the instep side and thread your needles through two rows (one row apart), right about where you want your leg to go. And then you snip the yarn and unravel a hole and knit a leg. Done. Although Cat argues with me about this, I can’t help but think of it as an afterthought leg. I know it isn’t really, because there’s no waste yarn involved. But, if you’ve ever knit an afterthought heel, it’s kind of the same idea. For my socks, I knit a star toe, followed by a foot, with a star heel on the end. I don’t think I’ve ever seen socks with a star heel before, but it looks pretty cool. I know this is a lame shot — off-white socks with tan pants against bleached wood floor. Beige. But work with me here, gentle reader. I wanted to show them on my real feet (as opposed to my fake feet) so you can see that these socks actually fit. They fit quite well. In fact, I admit to being surprised at just how well they do fit. My socks are not quite like the ones in Twist Collective. 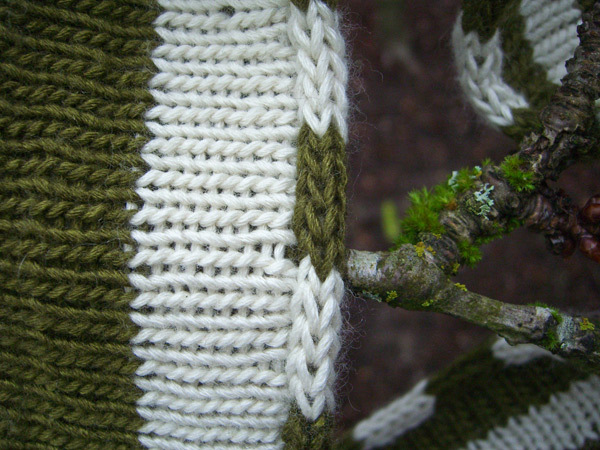 Mine are intended as house or bed socks, so I put heel stitch on the underside of the arch – it feels wonderful. There are some modifications to fit the socks to my rather skinny foot, and some experimenting (following Cat’s directions) with doing a higher arch. I knit both footprints at the same time, and also knit both legs at the same time, and I am pleased to report that this method lends itself to two-at-a-time knitting with no problem. It appears that the Houdini Sock and all its magic will be the subject of Cat’s next book, where she will explain all of the modifications that are possible. But, while we impatiently await publication… if the idea of sort of steeking your socks appeals, give it a go! These are great, by the way, for kicking around the house. I have mine on even as we speak and my tootsies are warm and comfy and feel very pampered. Needles: two circulars assembled from my Denise kit (which I’ve supplemented with a few extras), US#5 (3.75mm). 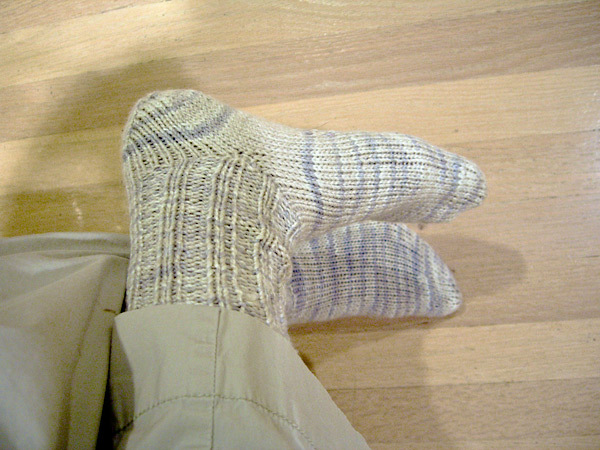 Pattern: Houdini socks by Cat Bordhi, basic pattern from Twist Collective with various modifications to make it fit my particular foot. This morning I am so proud to be an American. Last night we made history. 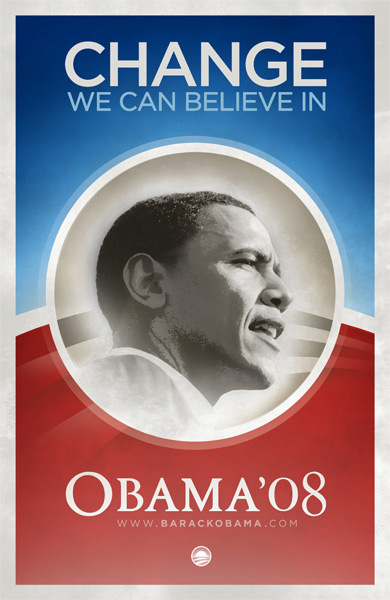 I have such hope for the future – hope I have not felt in a long time. Even McCain’s concession speech was inspired. In the center of my moebius is an O. It all started at the Island Retreat a couple of weeks ago. Some well-meaning knitter – I forget the exact context now – said something about double-knitting a moebius. I immediately wanted to do just that. Because I never had. And it sounded really cool. And you could have a moebius that had no purl side, but only a smooth knit side. And different colors. And what would those colors do when swirled around a non-orientable surface that has only one side and one edge? I immediately headed to Island Wools for yarn. Cat, who is wiser than I, perhaps saw the gleam of scientific inquiry in my eyes because she smiled and nodded and said nothing but sounds fun. Thus began a quest for how to cast the darn thing on. It kept twisting around itself in strange and other-dimensionally ways. 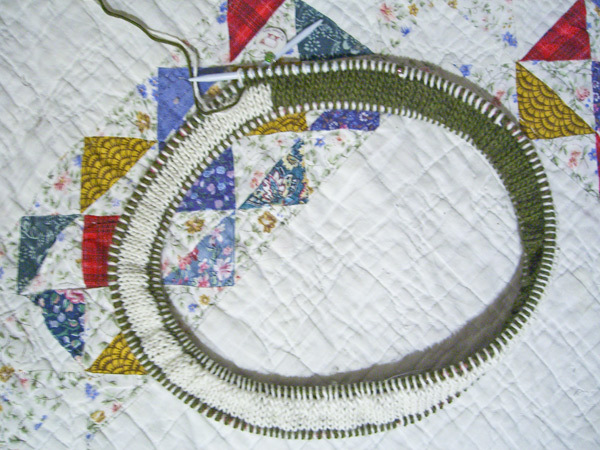 After much frustration and frogging bad words were said in my out-loud voice several false starts, I finally hit on a method that seemed to sort of work: I cast on two individual moebii, knit 1 ring on the white one and purled 1 ring on the green one. Remember it takes two rings to make a round, so I had worked 1/2 round on each. Then I threaded both on to a single long cable needle by alternating stitches. Gentle reader, I have learned more about topography in the last week than I ever expected to in my wildest dreams. I turns out that when you take two moebii and attach them along the edge, essentially what I did when I threaded the two on to one needle, the result is a torus (that’s a fancy word for a doughnut) with a moebius twist in it. And that’s one representation of a non-orientable surface called a Klein Bottle. And such beasties do not live in 3 dimensional space without some contortion. And I haven’t yet figured out the knack of knitting in 4-space, where they live happily but I do not. So what I knit in my little experiment is a Klein Bottle represented locally in my particular patch of 3-space by letting what I thought would be a moebius intersect with itself – which it wouldn’t do in 4-space. You can see the insertion point – it’s the point at which the green suddenly changes to white.The green has actually crossed through the white to reappear on the other side (if it could be said to have sides, although it really only has one), and the white has crossed through the green. But if you trace either color by itself, ignoring the other color, you will find that each is, really, a moebius. And together they appear to be a moebius. Sort of. If it weren’t for that pesky insertion point. 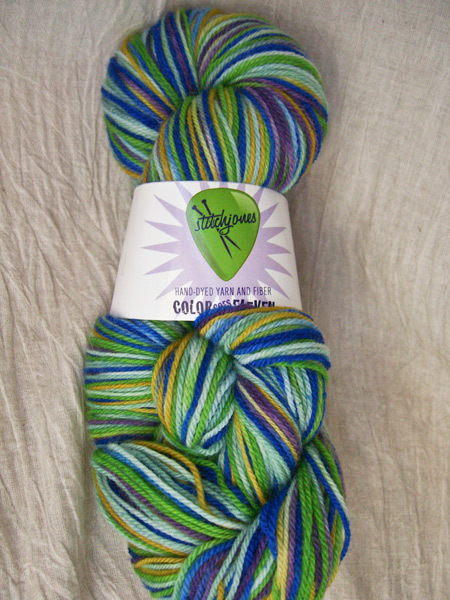 I don’t think there’s any way to get around the color change, short of knitting the whole thing in one color. But then what would be the point of double-knitting? I’ve decided instead to make the intersection a design feature by adding in random ones scattered about various places. We’ll see how well that plan works out. I may end up with a mess. And I have no idea how I’m going to bind this thing off, but I’m open to suggestions. I hope I don’t sound like I understand what I’m talking about, here, because really my math is not good enough to understand it in more than lay-person’s terms. All of this stuff makes my brain hurt. But, nonetheless, this is the sort-of-moebius that’s on my needles and that I will be knitting today with healing intentions. I do think it’s cool that, even though there are two colors, there are really no sides. And although the green and white started out as completely separate entities, they have now merged in new and unexpected ways.